GadgetTrak dramatically increases the likelihood of finding your laptop, by pinpointing its location, and even sending a photo of the thief. 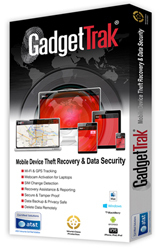 Using Wi-Fi positioning technology, GadgetTrak can pinpoint your laptop's location, usually within a few meters! Snap a photo of the thief to collect crucial evidence that the police can use to get your laptop back. File a police report online with over 150 police departments across the United States. With our high recovery rates we have a history working with and assisting law enforcement. Once tracking is activated the software settings cannot be modified unless deactivated. GadgetTrak's data center is in a highly secured tier 4 facility, including on-site armed security around-the-clock. Only you can access your location reports and web camera. All images, network information, and location data are sent directly to you from your computer system. This is a 1 year subscription product.